Bead & Button Magazine sponsors "Bead Dreams," a juried competition of exceptional bead artistry from around the world. The accepted pieces are displayed at the Bead&Button Show and ribbons are awarded in seven categories including Lampwork. "Winter Dreams," by Susan Matych-Hager, was juried into the competition for 2013. The exhibit was installed at the Bead & Button Show in Milwaukee, Wisconsin in June, 2013. "Winter Dreams" was awarded Second Place in the Lampwork Category. 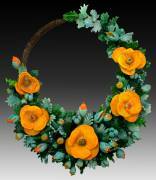 This necklace is the third in a series of necklaces depicting "THE SEASONS." Three X Two was a collaborative effort between the ISGB and metalsmiths from the Seattle Metals Guild (SMG. ISGB members were invited to create three similar focal beads which would be incorporated by the metalsmith into pendants, rings, or brooches. The beadmaker and metalsmith each retained one of the finished pieces. The third piece was displayed during the 20th anniversary Gathering conference at Facèré Jewelry Art Gallery in Seattle. 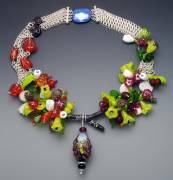 This 2012 juried prestigious exhibition of the International Society of Glass Beadmakers represented works produced by artists from around the world who were challenged to express an indelible memory in jewelry made with glass beads. These exceptional pieces were exhibited in Seattle, Washington, Yokohama and Kobe, Japan and Rochester, New York. This necklace is the first in a series of necklaces depicting "THE SEASONS." Bead & Button Magazine sponsors "Bead Dreams," a juried competition of exceptional bead artistry from around the world. The accepted pieces are displayed at the Bead&Button Show and ribbons are awarded in seven categories including Lampwork. "Yellow Poppies," by Susan Matych-Hager, has been juried into the competition for 2011. The exhibit will be shown at the Bead & Button Show in Milwaukee, Wisconsin in June, 2011. Surface is a juried exhibit that opened at the 2011 Bead&Button Show in June in Milwaukee, Wisconsin. 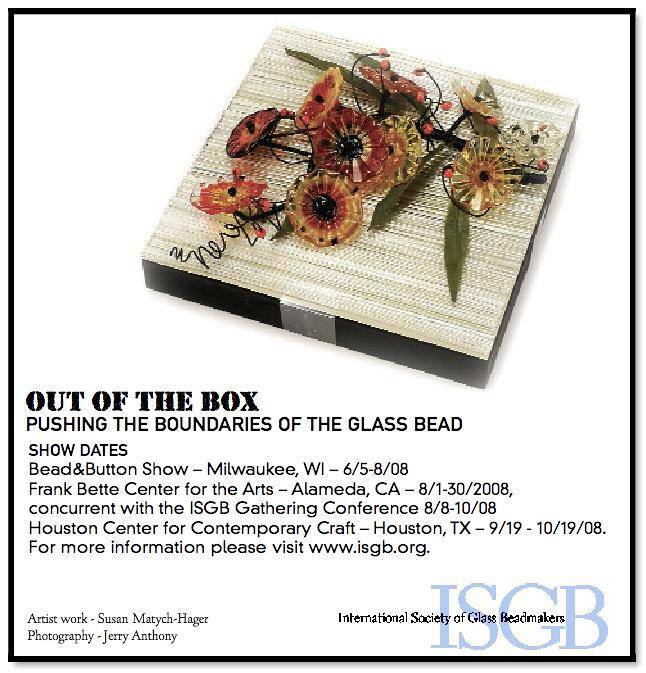 Designed especially for the Show, it is another part of the continuing relationship between Bead&Button, ISGB, artists, students, collectors, exhibitors and writers who come together for this amazing annual event in celebration of the many facets of art that unite us all. Surface represents the fifth year of presenting extraordinary glass exhibitions with the Bead&Button Show. "Poppy and Leaves" by Susan Matych-Hager has been juried into the Surface exhibit. This is the third in a series of collaborations of designer and glass beadmaker sponsored by the International Society of Glass Beadmakers. Kathy Petersen, designer and Susan Matych-Hager, glass bead artist, collaborated to create "Field of Poppies," inspired by the work of the same name by Vincent VanGogh. The traveling exhibit represents the juried work of an international roster of contemporary glass bead makers and designers. This is the third consecutive year that Kathy's and Susan's work has been selected for the exhibit. This is the second Convergence collaboration with Kathy Petersen, designer and Susan Matych-Hager, lampwork artist. Our entry, "Queen of the Faeries," was inspired by the fuchsia shrubs so abundant in Ireland. The necklace uses fine silver wire crochet, pmc, wire, Swarovski crystals and handmade lampwork beads in the shape of fuchsia flowers, buds, pods and leaves. Yellowstone is a story piece necklace created with chain maille and art-glass beads. It is built around the themes of "Convergence" which required the artists to include one or more of the four elements: earth, wind, fire and water. Telling the story of Yellowstone after a major burn, and moving from the flames and water (chain maille) to the charred rocks and cloud bead clasp, the seeds released by the burn burst into masses of flowers found in the valleys of Yellowstone. Collaborators Kathy Petersen and Susan Matych-Hager are pleased to be included in this prestigious exhibit sponsored by the International Society of Glass Beadmakers and Bead and Button Magazine. Projects featuring Hager Studios beads in Bead and Button Magazine. 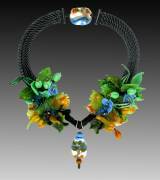 The juried annual "Women in Glass" issues of "The Flow" magazine includes Hager Studios beads.